Next slice carrots into a small dice. Slice garlic into thin slices. Remove thyme leaves from the stems. Add a quarter cup of olive oil to a large sauté pan and bring to a medium-high heat. Sauté diced celery and onions, carrots and garlic for about 10 minutes or until soft. Remove from heat, let cool, and add to the bowl of bread cubes. Add fresh thyme, and salt and pepper to the bowl. Crack eggs into the bowl and begin mixing by hand until the bread soaks up all the egg. Press mixture into a greased casserole dish. Pour chicken stock over the top the stuffing. 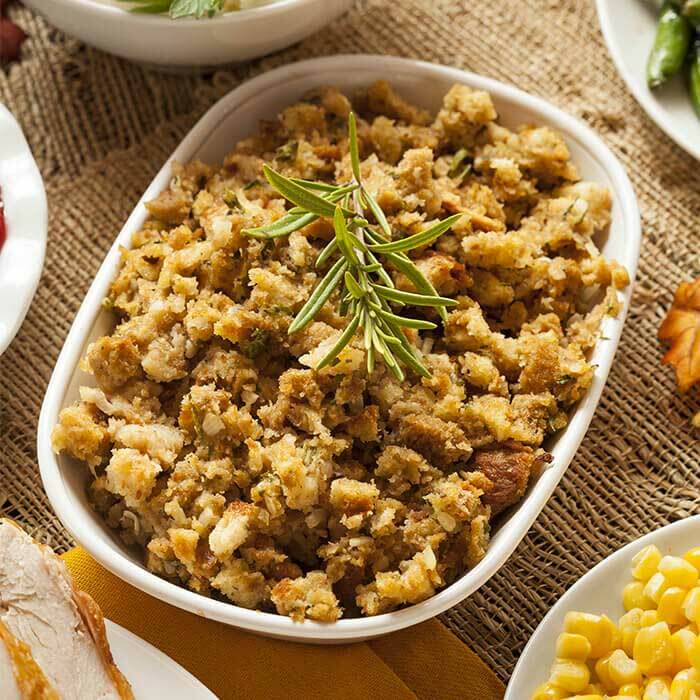 Bake stuffing for 45 minutes or until fluffy and firm. Remove, let cool and enjoy!